Now, in a paper published today in Nature, that same group reports that the two innermost planets in the system are primarily rocky, unlike gas giants such as Jupiter. The findings further strengthen the case that these planets may indeed be habitable. The researchers also determined that the atmospheres of both planets are likely not large and diffuse, like that of Jupiter, but instead compact, similar to the atmospheres of Earth, Venus, and Mars. To help Julien and his collaborators find more Earth-like planets around ultra cool stars, there is a need for at least three additional small telescopes to be built and operated in the Northern hemisphere to identify suitable terrestrial planets for further characterization before the James Webb Space Telescope is launched in 2018. The first such 60cm telescope is currently being built for the Northern sky in Morocco - expected to be up and running by September 2016. To complete the monitoring of the brightest ultracool dwarfs, two additional telescopes of 60cm are required - but each telescope requires an investment of $400k. If you’d like to help MIT be a full partner in this historical initiative searching for habitable planets outside of our solar system, please contact Angela Ellis, EAPS Development Office at 617-253-5796 or aellis@mit.edu. Find out more at New Worlds, New Priorities. 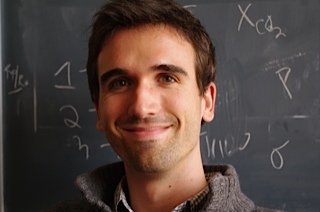 Julien de Wit is a postdoctoral associate working in the Seager Group. As Julien puts it his primary interest and expertise "lie in the field of data science where Math and Science are brought together to make sense of newly accessible pieces of Reality!" Over the past five years, he has developed and applied new analysis techniques to map exoplanet atmospheres, study the radiative and tidal planet-star interactions in eccentric planetary systems, and constrain the atmospheric properties and mass of exoplanets solely from transmission spectroscopy.